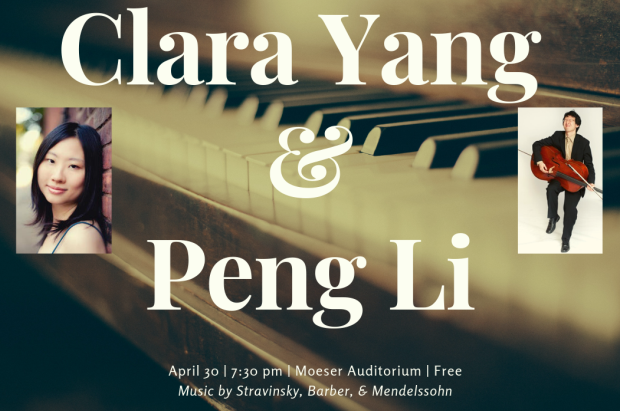 Faculty Recital: Clara Yang, piano, with Peng Li, cello. Associate Professor Clara Yang, piano, performs with Peng Li, Assistant Principal Cellist of the North Carolina Symphony. Suite Italienne, for cello and piano, Igor Stravinsky, arranged by Gregor Piatigorsk; Cello Sonata, Opus 6, Samuel Barber; Cello Sonata No. 2, Opus 58, Felix Mendelssohn.